But now that I’m riding primarily western my tackroom has taken on a whole new look. 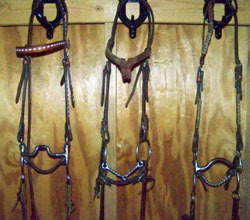 There are headstalls with rawhide buttons, silver conchos and buckstitched browbands. 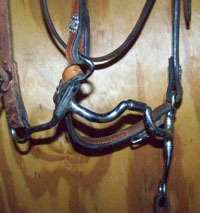 Split reins made of harness leather tend to tangle together like tough spaghetti. Plus there is a whole new breed of bits. Slowly—bit by bit, if you will—I’ve been collecting western bits as I learn which works best with each of my two Paint geldings. It took me a while to get used to them, as if I needed a formal introduction before I felt comfortable shaking hands… or holding the reins connected to them. I was certain that the curb bit would be too much for Wally and that the twisted wire snaffle was too severe for Joey. 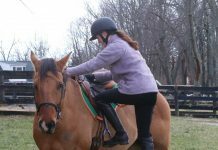 But then I had to remember one of the commandments my very first riding instructor taught me: It’s not the inherent construction of a bit that makes it mild or severe; it’s how the rider uses the bit. The mildest snaffle can become a tool of torture if a rider has an insecure seat and rough hands, while a high port curb can be an artistic instrument in the hands of an educated rider. And thus I’ve come to learn that Joey is just fine with the thick twisted wire snaffle, the one that came with him when I bought him. I half-halt (I mean “check him”) with it once in a while to slow his pace or help him collect and balance, and then I immediately soften my feel of his mouth as a reward. It’s not severe when used like that at all. In fact, it keeps him very light in my hands, so that he jogs and lopes around the arena on a loose rein, just like a western pleasure horse should. But my favorite western bit for Joey is the one with the most forbidding name. It’s called a correction bit. One of my huntseat acquaintances recoiled in shock upon hearing that I was using something called a correction bit on a three-year-old. But once I showed her the bit, and demonstrated how it worked, she began to comprehend that the word “correction” didn’t mean the same as “punishment.” There are all sorts of correction bits, but this particular one is a mild low-port one made by Myler. Now, I’m not about to go on record recommending Myler bits for everyone. But this one works for me and my young horse. It’s extremely pliable and multi-jointed, making it the perfect bit to help Joey transition from a snaffle to a plain curb bit as he learns to neck rein. And with the multiple joints, there’s a great deal of play in the bit. I can isolate one light cue at a time. For example, by lifting only the inside rein I can encourage him to lift his inside shoulder. Naturally, such bit of wonderment doesn’t come cheap. In the Cindy Hale form of currency, this nifty little correction bit cost me the equivalent of nearly four bales of hay. But since my horse likes it, and it’s working for the two of us, I suppose it’s worth it… right? If you have a favorite bit, go back to the home page of HorseChannel and read HI Spy, where you can sing the praises of any bit that’s brought you and your horse good luck or that has helped you work through a training issue. Or you can click on this link: I Believe in This Bit. In the meantime, I’ll probably be browsing the local tack stores, looking for bits to add to my new museum. wow cindy! I always love the this cost___Bales of hay! much easier currency to calculate for us horse owners!